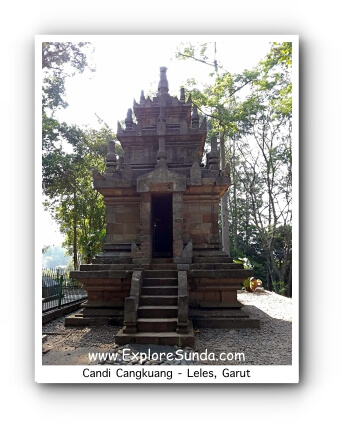 Cangkuang is located in Leles, Garut. The GPS coordinates are -7.102879, 107.918863. The small road to this area is on the left side of the provincial road from Bandung to Garut. The bamboo raft or getek is a big raft where up to 20 people can travel together. The ticket price is not expensive at all, Rp. 4,000 for a round trip. We also can rent the whole getek for Rp. 80,000 to circle the lake. The rental price is not fixed though, we still can negotiate it with the boatman. 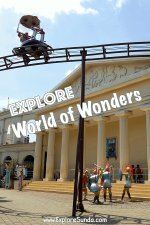 Although getek is only made from bamboo tied together, it is stable and sturdy, where people can walk on it comfortably, even my daughter jump on it. The small tricky part is only in getting on and off it to the pier. The lake itself is rich with fishes, such as carper and mujair (Mozambique tilapia), as well as a fresh water clam called kijing (Pilsbryoconcha exilis). We will see the fishermen in smaller getek. 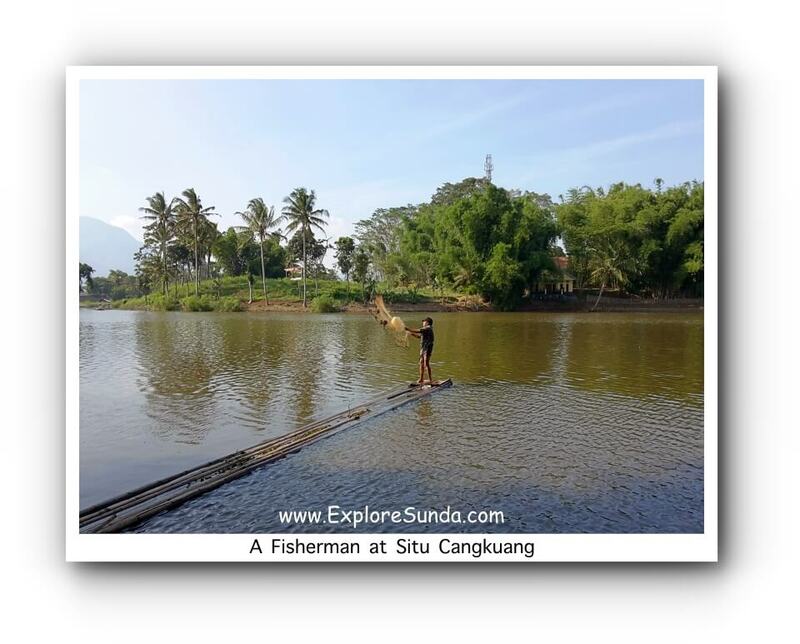 They bring net to catch the fish or we can see their heads while they walk to feel any kijing on the bottom of the lake. So, the lake is not too deep, it's approximately 1.5m. Sometimes we could view lotus bloom at the corners of the lake. 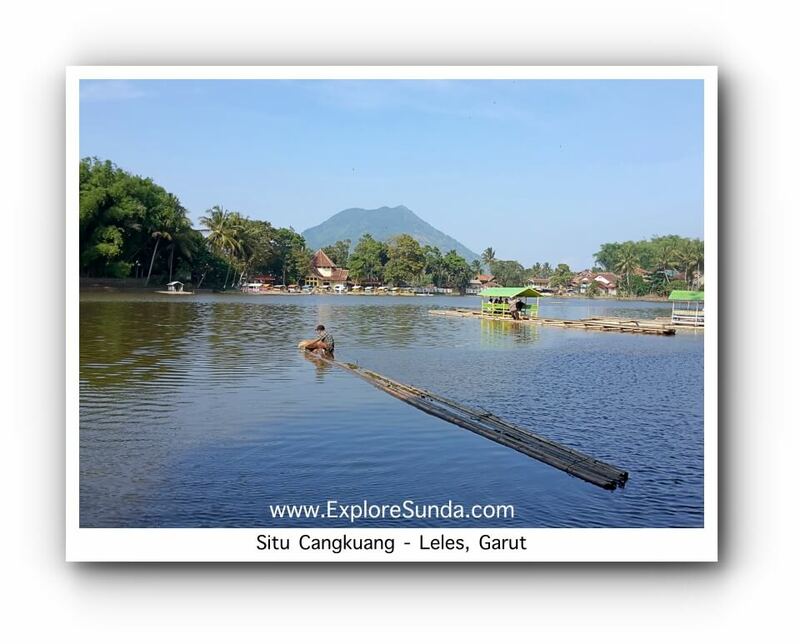 It seems that time slows down while we enjoy the peaceful view and the cool soft breeze in Situ Cangkuang. Once we reach the island, we will walk through souvenir and snack kiosks. 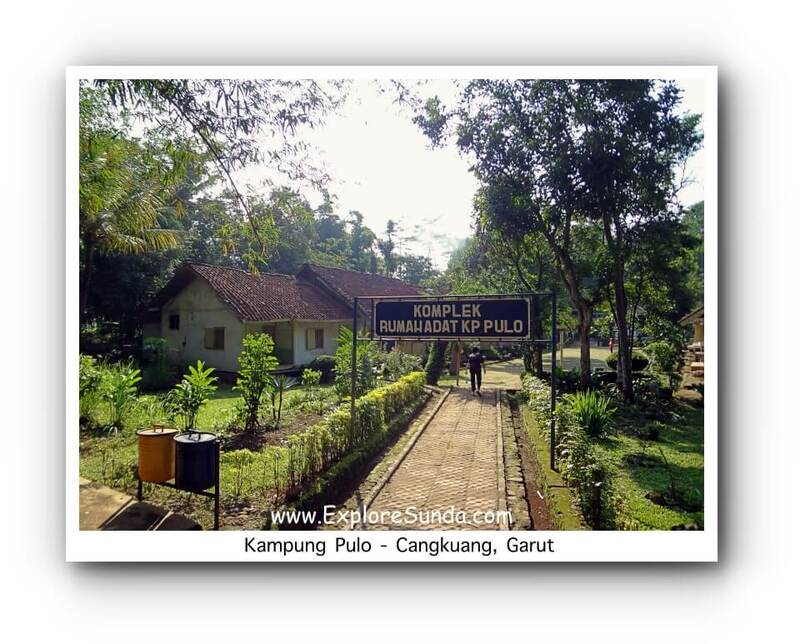 Then we will enter Kampung Pulo. Kampung Pulo is a very traditional village. There are only 6 houses there for 6 families. When the number of families living there have grown, some of them have to move out of the village. From time to time Kampung Pulo held cultural presentations, such as demonstrating how they produce paper from the bark of trees as well as the ink. 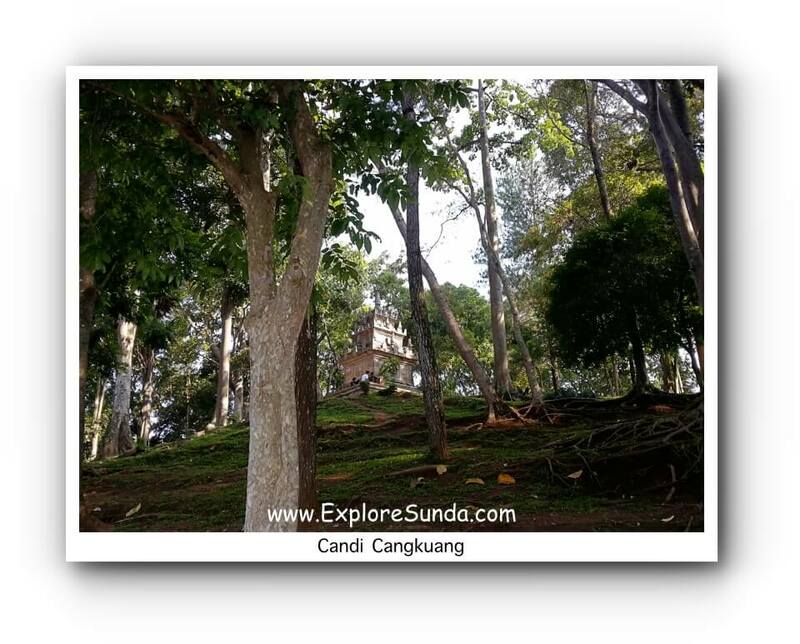 Candi Cangkuang (candi = temple) is nestled under big shady trees on top of a small hill. The temple got its name from the many cangkuang trees that grow nearby. It is a kind of pandanus plant. The temple is the only completely restored temple in Sunda. It was ruined with most of its andesite stones scattered all over the ground when it was found in 1966. The statue of Shiva and Nandi (Shiva’s vehicle in the form of a bull) found there marked it as a Hindu temple. The restoration was completed in 1976. 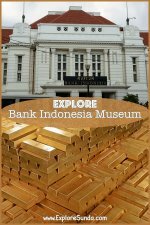 Next to the temple is an ancient tomb of Embah Dalem Arif Muhammad. 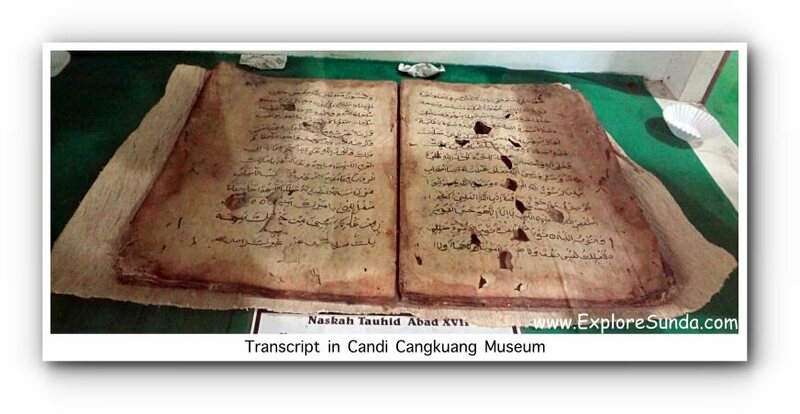 He was believed as the ancestor of people in Kampung Pulo. There is a small house right in front of the temple. Originally, it was used to store important artifacts during the restoration. Once the restoration was completed, it functioned as a museum. The museum has documentations starting from the finding of the temple, during restoration, until it was completely restored. 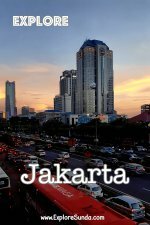 Have you visited other temples in ExploreSunda.com?